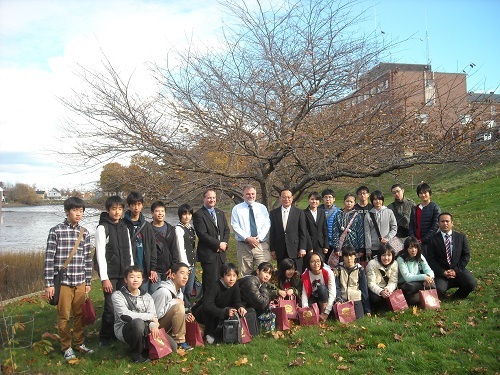 Portsmouth, New Hampshire (October 30, 2014) -- Visiting Sister City exchange students from the Nichinan Gakuen Jr-Sr High School in Nichinan, Japan will place a granite plaque for the Portsmouth Peace Treaty Living Memorial cherry trees on the banks of South Mill Pond, opposite the Portsmouth Middle School on Thursday, October 30, 2014 at 1:30 pm. Each year students from Nichinan visit Portsmouth as part of the ongoing Portsmouth-Nichinan Sister City exchange program with Portsmouth High School. In May 2014, Portsmouth Middle School's Student Council members planted cherry trees on the banks of the South Mill Pond where cherry trees given to Portsmouth by Sister City Nichinan have bloomed since 1985. The new trees are cherry trees descended from the iconic Washington DC cherry trees -- give to the US in 1912 by Japan in thanks for the Portsmouth Peace Treaty, signed at the Portsmouth Naval Shipyard, ending the Russo-Japanese War in 1905. The Japan-America Society of NH arranged for Portsmouth to be one of the 36 cities to receive trees on the 100th anniversary of the original gift. JASNH is working with the NH Division of Forests and Lands Urban Forestry Center to plant them in Portsmouth at key Treaty sites and elsewhere as a Portsmouth Peace Treaty Living Memorial. The students visit the Portsmouth Peace Treaty exhibit at the John Paul Jones House Museum on Friday, October 31st.